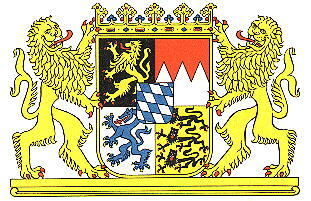 The city of München presently only uses the right arms as the official arms. 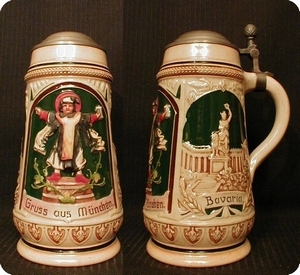 Until 1957 the left arms were the official great arms, the right arms the arms for daily use. 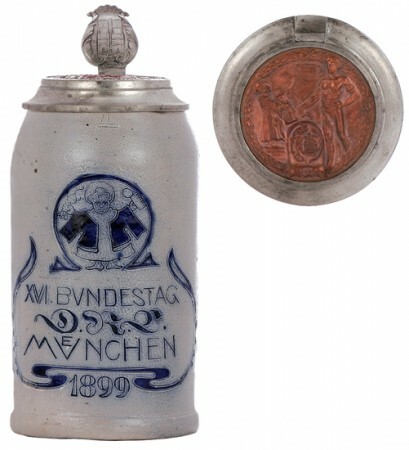 The Munich arms with the gate have not changed since and were officially granted as city arms in 1834 by King Ludwig of Bayern. 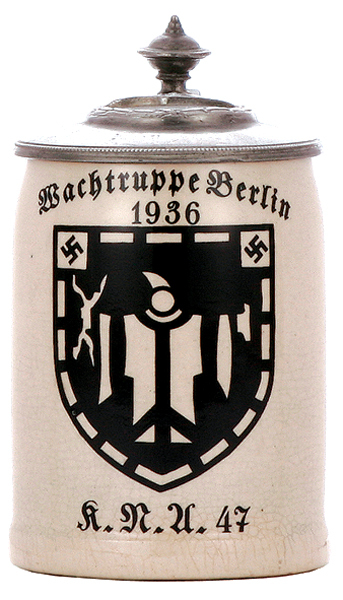 From 1936-1945 the lion was replaced by the eagle used by the Third Reich. The use of the great arms was abolished by law from December 17, 1957 and only the small arms have been used since. 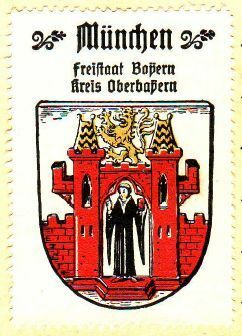 The monk as a single figure has been used on a small seal dating from 1304, and on the banners of the city since the mid 14th century. 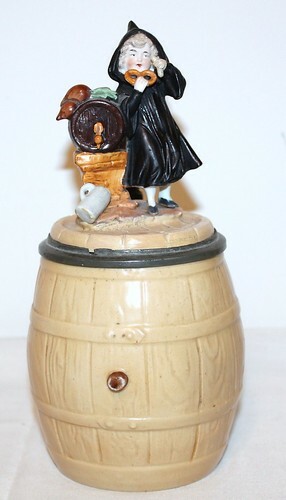 The shape of the monk has changed considerably during the centuries. 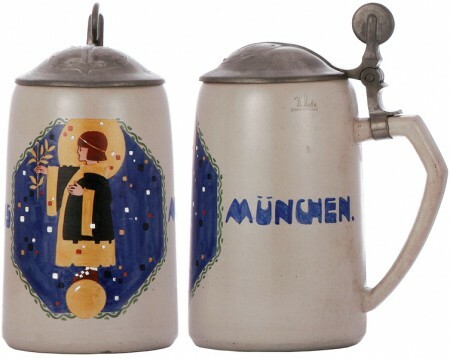 The now most recognized name in SCI circles for the symbol of Munich on beer steins is the “Münchner Kindl,” (meaning the “Munich Child”) but if I had used that then the title of this web page would have to read: The “Children” of Munich. So I think “Maids” reads better. 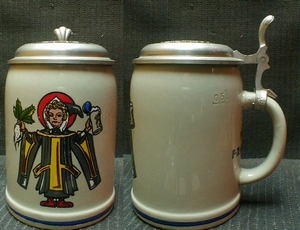 This is what I was always taught to call them anyway, as there are very, very few “Munich Monks” and “boy children” pictured on steins, unless perhaps they are displaying a reference to the old city Coat Of Arms, such as this one shown just below. 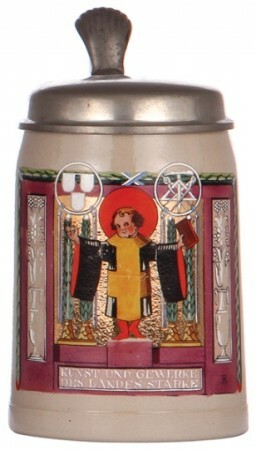 Nazi stein .1/2 liter pottery, dated 1936. My intent with development of this page is not to reinvent the wheel. 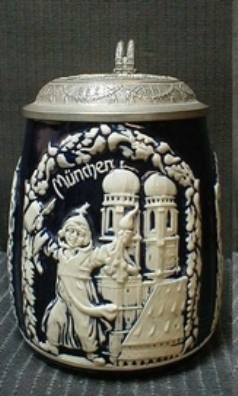 A lot of collectors have been exposed to the monumental work of art on souvenir’s of Munich, originated in and published by Munich’s City Museum. 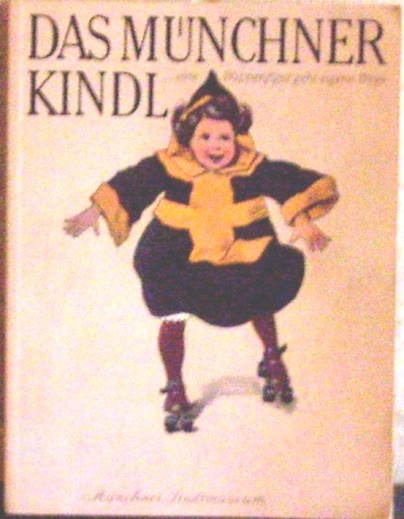 Cover shown below. If you don’t have this book in your reference rack” you really should! 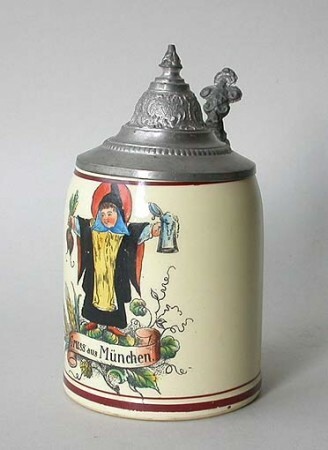 But on the other hand a lot of new and even some older collectors have no idea the volume of Munich steins showing the “Munich Maid,” “Munich Monk” or the the “Munchner Kindle.” So I have taken it upon myself to rectify that situation and present what I hope will be a well rounded collection photos of of steins that can be purchased on the retail stein market these days, here in the USA. 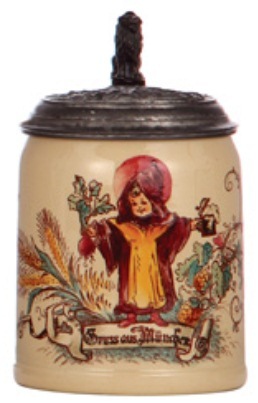 As a new collector are you familiar with the picture of a child, dressed in a cowl, with radishes in one hand, a filled beer stein in the other, smiling devilishly from a stein decoration? 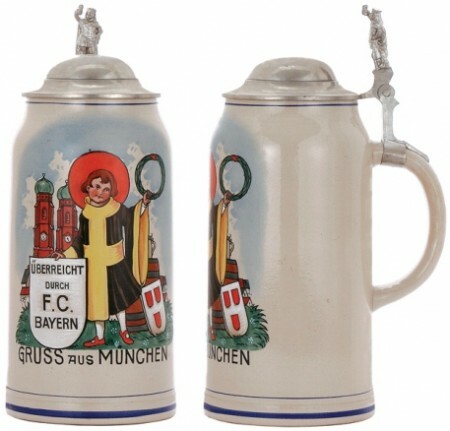 The saying on the stein is usually” Gruss aus München” (Regards from Munich”) But how many collectors know that this figure is really a semi-comic take-off of the official Munich coat-of-arms? The first written proof of Munich as a small settlement of monks dates from 1158 A.D. With the increase of the population, the town administration developed a constitution of the council. 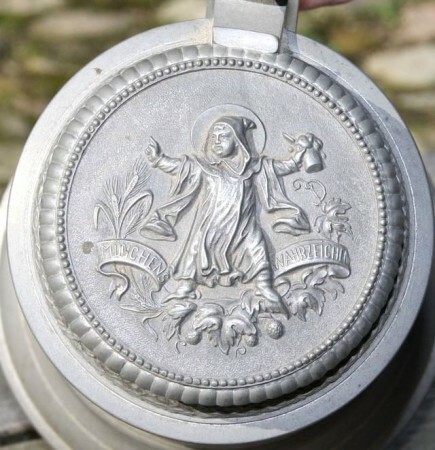 Soon a seal was used to prove the authenticity of town-council documents. The oldest seal of Munich, of which only fragments are left, with the presumable inscription “Sigillum Civitatis Monacensis” and the picture of a monk wearing an open hood, appears on a document of May 28, 1239. In the course of the following centuries a number of slightly varying representations of the seal were used. 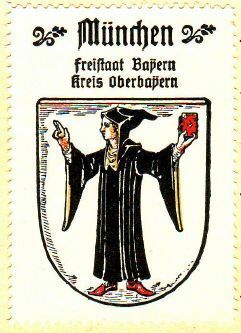 But all of them show the monk with the book (of city laws) in his left hand, while his right hand with three outstretched fingers is held up. Next to most of these seals is shown a town gate and an eagle, which, in the fourteenth century, is replaced by a lion (of the coat-of-arms of the reigning dynasty of the Wittelsbachs). For some time the monk was represented in profile, later full-face and bare-headed. 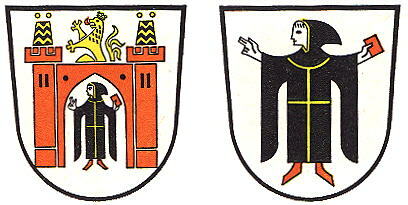 Colorful representations of the town coat-of-arms go back to the fifteenth century. From then on the features of the heraldic figure began to lose their serious character, the face became more youthful, the hair sometimes even curly. 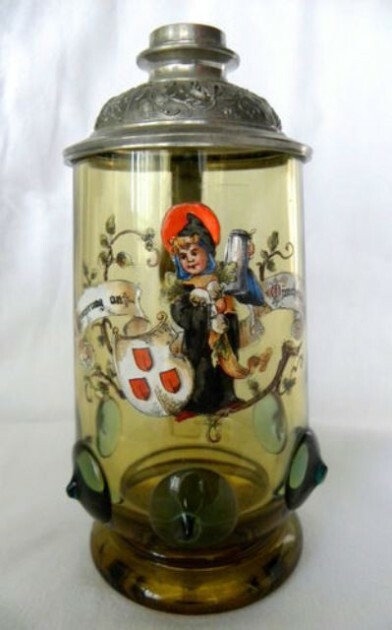 The present form of the official coat-of-arms with a monk in black cowl, (law) book and blessing in right hand, was given to Munich by the reigning king, Louis I, on September 16, 1834. 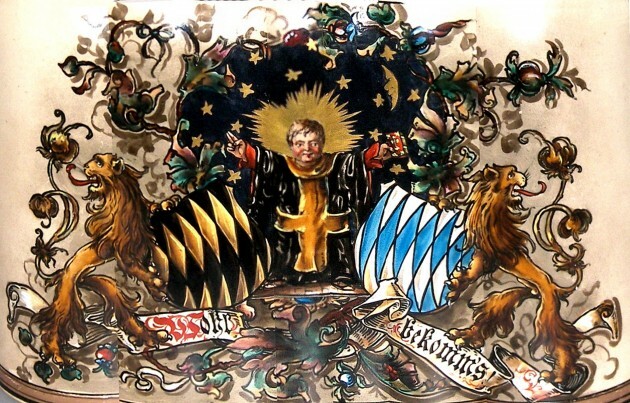 At the request of the Magistrate of the city, King Louis II [aka ludwig -(he was the king who, in 1886 was drowned in the lake of Starnberg) granted minor changes in the coat-of-arms on June 11, 1865, from his castle at Berg (the book and shoes of the monk were given a red color). Since that time no further significant changes have been made. 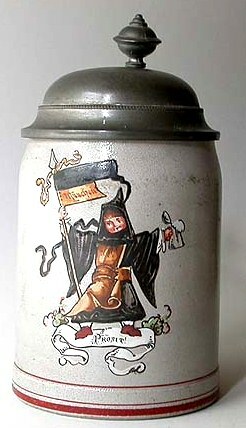 It is not known when the “Munich Child” (Munchner Kindl) appeared in the coat-of-arms for the first time or who gave it the sympathetic name. 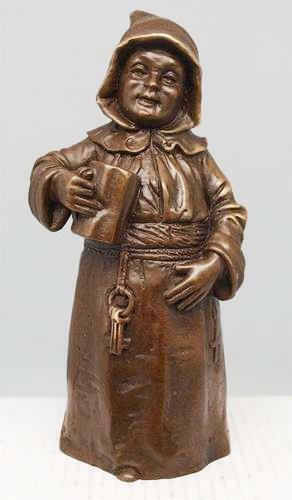 Some representations of the fifteenth century already show the child figure instead of the monk. 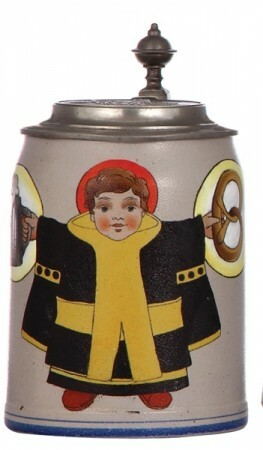 The metamorphosis was not brought about by some order of the sovereign, but instead by artists, by the seal and copper engravers, by the sculptors and painters who transformed the old bearded town-monk into a curly-haired child resembling the Christ child who appears with blessing hands on the altars at Christmas. 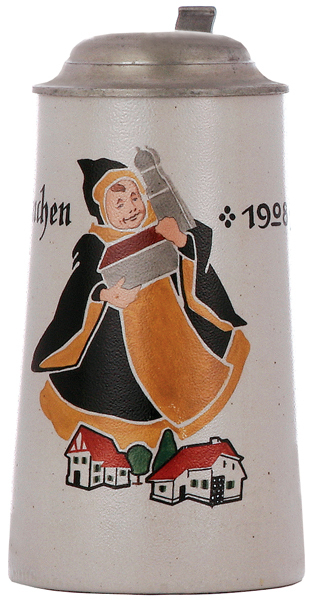 A medallion which the town gave in 1577 to the Brotherhood of crossbow marksmen, as well as painted “cartoons” of 1579, show the “Munich Child”. 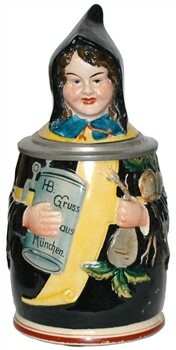 The most charming impression is given by a miniature, dating to 1686, in the town law book showing the “Munich Child” with a red halo. 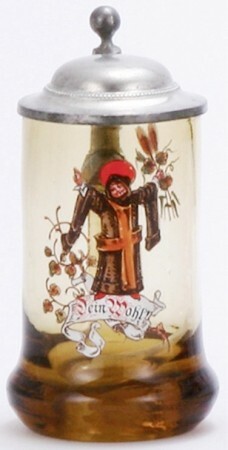 These old representations of a child instead of a monk are among the possessions of the Historical Museum of the City of Munich and the City Archives. 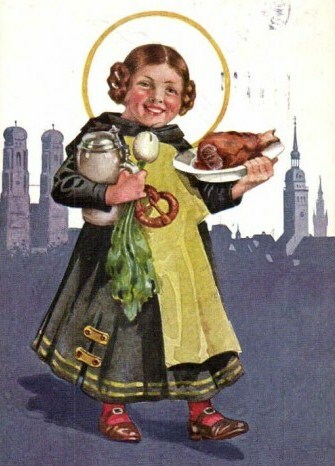 The child has appeared with and without hood or halo, with radishes in either hand, with the book of law or a pretzel, and with hand extended in a blessing. 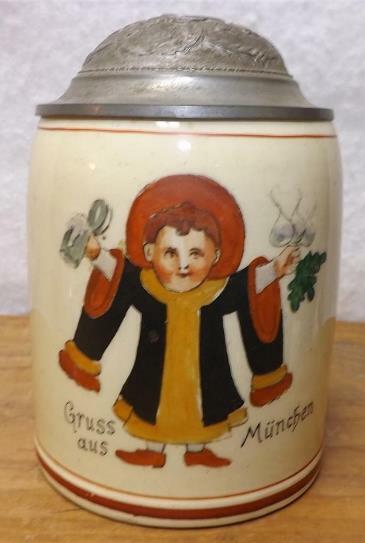 The good humor and inexhaustible fancy of Munich artists of the second half of the nineteenth century added various supplements to the image of the child: a laurel wreath, a foaming beer stein, radishes and pretzels. The pretzel gives an added dimension to the frame on this piece. 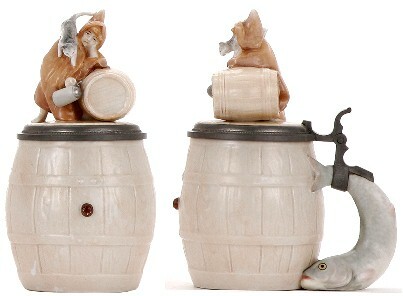 These humorous additions made the Munchner Kindl the well-known symbol and guardian spirit of the city and its festive events. 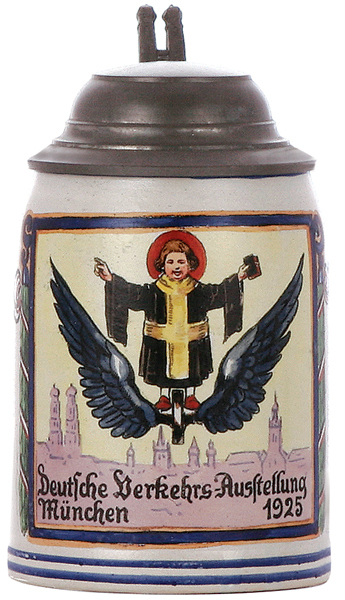 For a long time the “Munich Child” was a boy who did not deny his artistic descent from the town monk. Around 1890, Munich artists, in the fashion of the French /European art term; “fin de siecle”, began to represent the child as a girl. Interesting differences in the representation of the child are the rule rather than the exception. 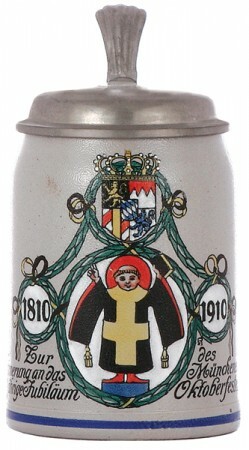 But the child figure in the seal and on the steins has no official character. The monk-head still graces the official seal! Italicized excerpts above are from an article written by jack Lowenstein, a departed SCI Master Steinologist and great councilor to me early on. ORGANIZATIONS HOLDING MEETINGS IN MUNICH OVER THE YEARS. 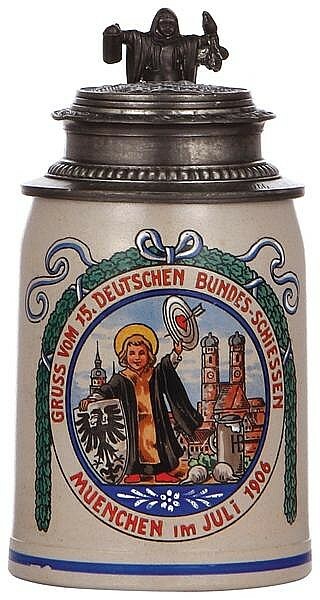 A .5 liter for a stage artist and construction guild I believe. Signed Ringer. A very nice shooter’s prize. 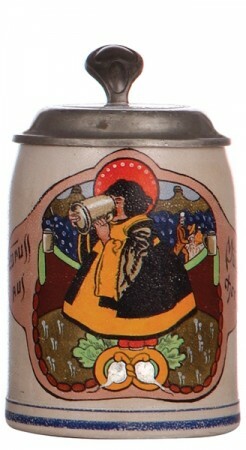 The Munich Maid standing at the “crest” on the antlers is a very nice design touch. Most likely a monk, yes? But in mid eastern clothing. 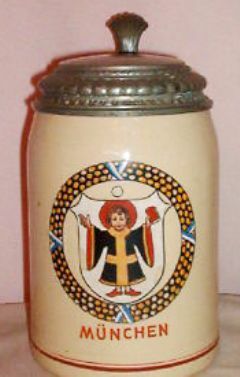 .5 Liter pottery, marked “Original Mold” – with the Thewalt pyramid mark. Circa 1990. 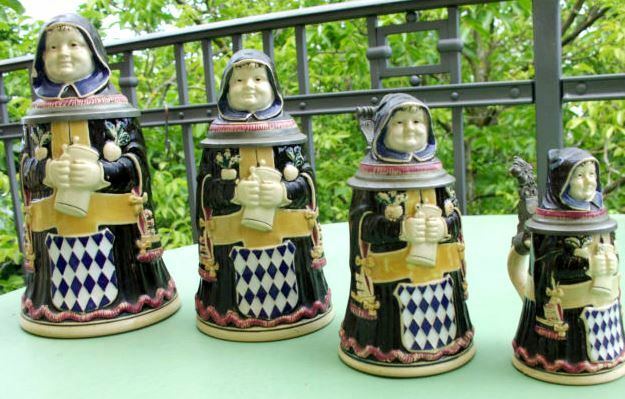 Four different sized pottery character Munich Maids steins marketed by Josef Reinemann. 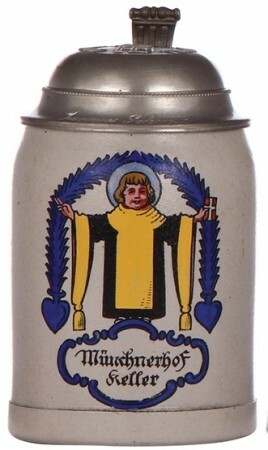 München. [L] .25 liter All others below are .5 liter. 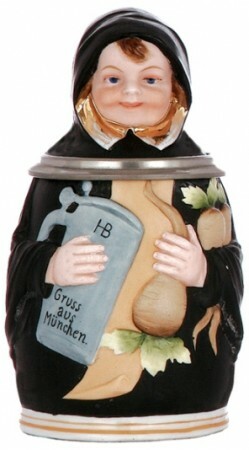 [R] Not all Thereseinthal’s ‘Munich Maids’ have the red halo, but the majority found will. 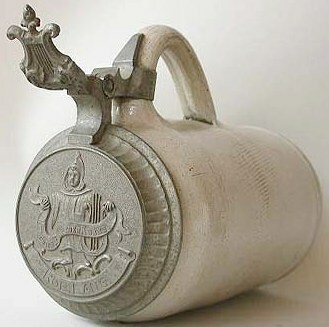 A .5 liter stoneware, made for a Munich beer drinking hall. Just really well painted. I like it! 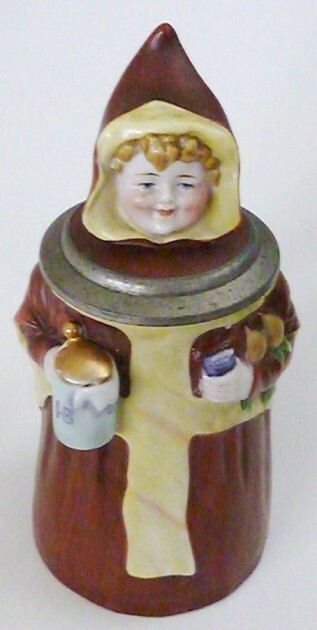 VERY JUNGSTIL (ART DECO) = MONK OR MAID? 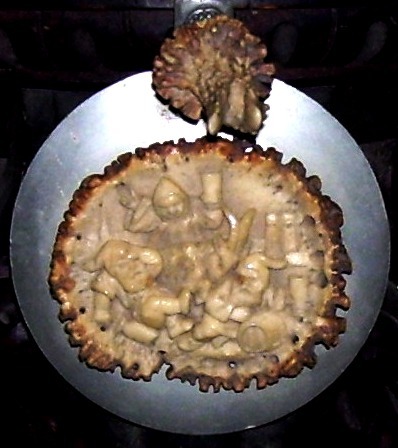 Here’s another one that is anyone’s guess. 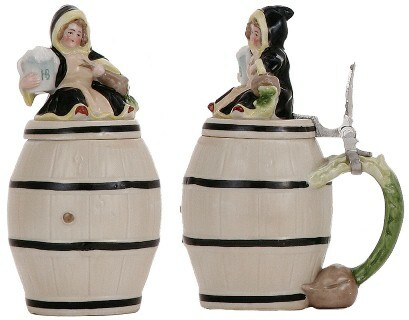 Maybe it is a “Butch” Maid? 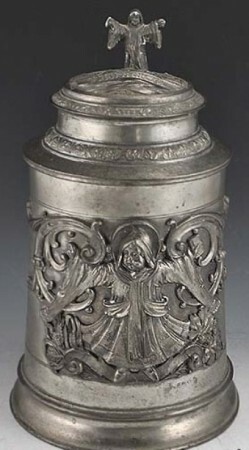 Heavy relief pewter stein by Lichtinger, Munich. Ca 1885. I really like the boldness of this design! Another shooting contest prize. The Imperial eagle on the body indicates this was a national event. 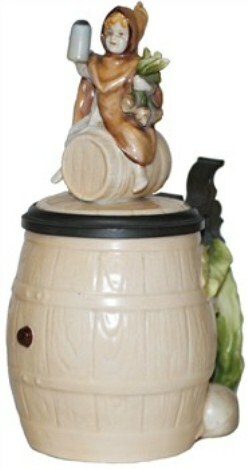 Circa 1900, .5 liter stoneware. The colors the “Maid” wears here are the old colors of Munich. 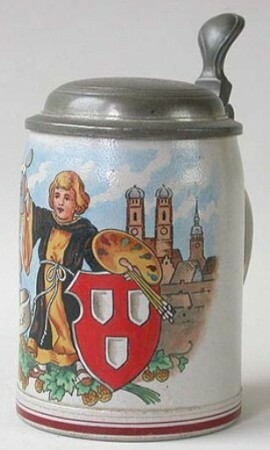 See photo : “And one the top 10 prettiest Munich Maid steins of all times”, just above, where both this colors and that of the Wittelsbach’s (Ruling family of Bavaria) are shown. 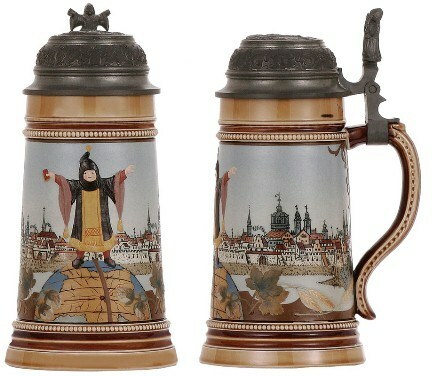 [L] Marzi-Remy Stein made for the 1972 Munich Olympics. Also made for the ’72 Olympics. 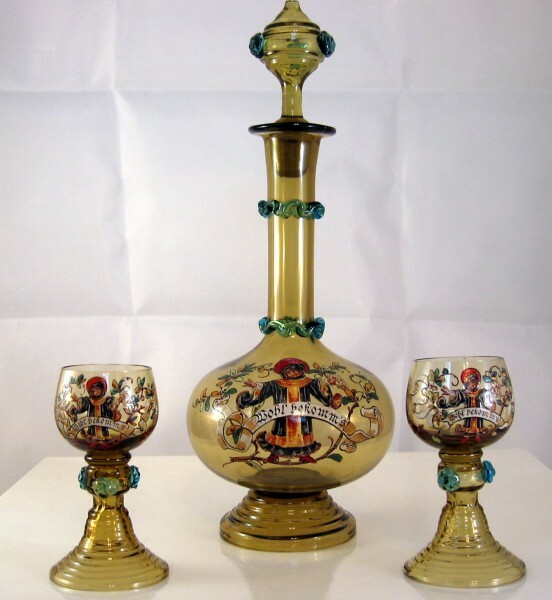 The variety is only limited by the number of stein makers existing at that time. 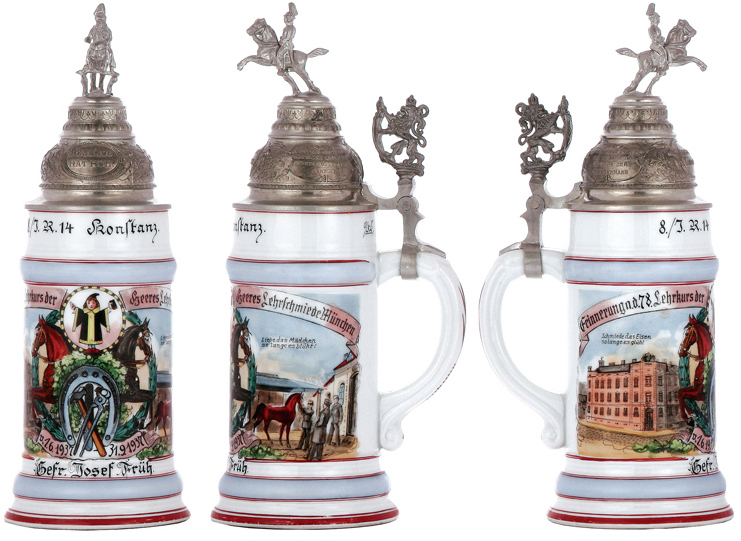 VERY CHEAP TOURIST SOUVENIR STEINS. I am not wasting the reader’s or my time listing many of these. They are not highly collectable (in SCI) anyway. 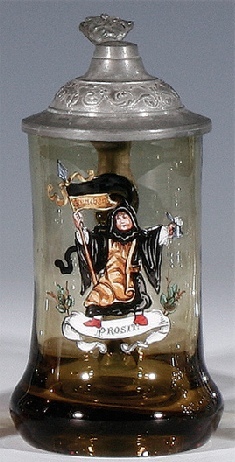 A reservist’s stein for a member of the Military black-smith’s school located in Munich. 15.9 ht., plaster statue, marked Jos. M. Mayer. 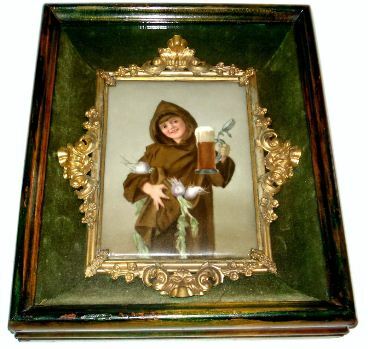 KPM Porcelain Plaque Munich Child – framed – ONLY asking $2495 in 5-2011.